Do you love cheese? YES. Do you love Bacon? YES. 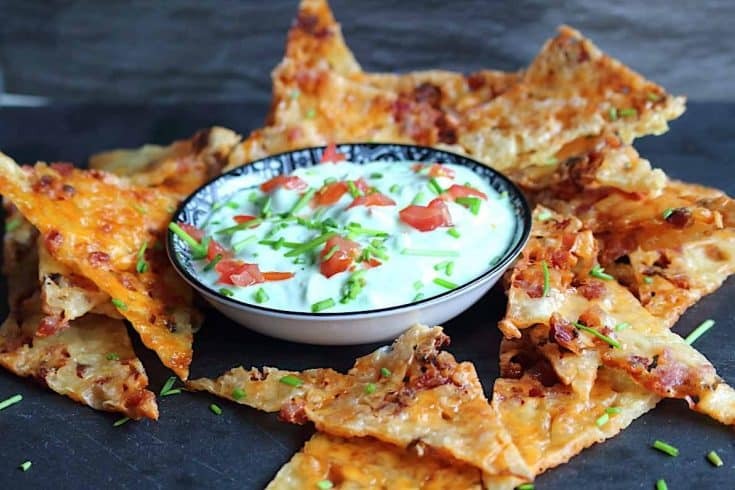 Do you love Nachos? YES. 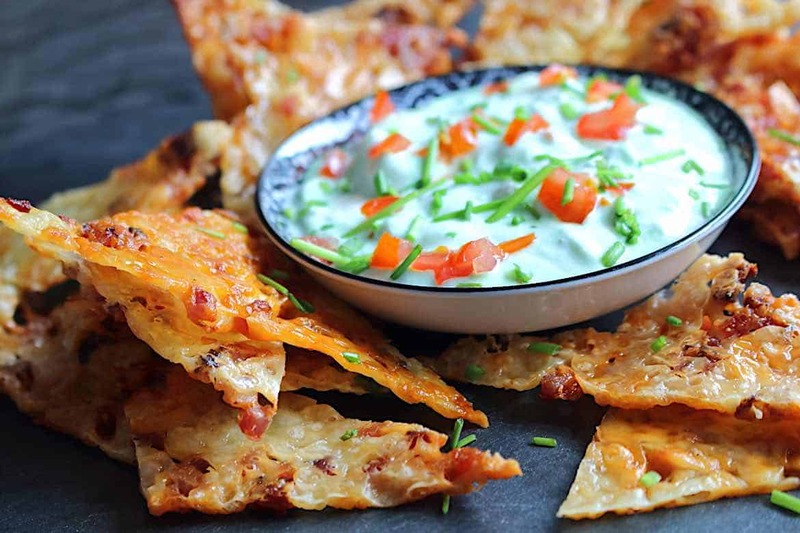 If all 3 answers to this are YES, then you have to look into our Keto Cheese Bacon Nachos. Easy to make, tastes outstanding and everyone fights for them. 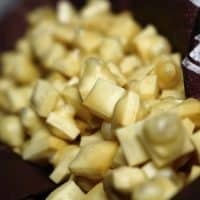 They are filled with a perfect crunchiness, stays in the airtight container for a while and are perfect with any dip you desire. If you want to check our Homemade Cheese Dip, go ahead, but a plain yogurt or avocado dip or this Wild Garlic Ramp Pesto is also an option. 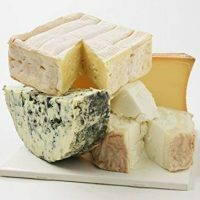 I have chosen 2 types of cheese to go with this recipe, but again it is really up to you which type you choose and how many variations. The most important here are those tiny bacon pieces. This gives you a perfect mixture of taste. 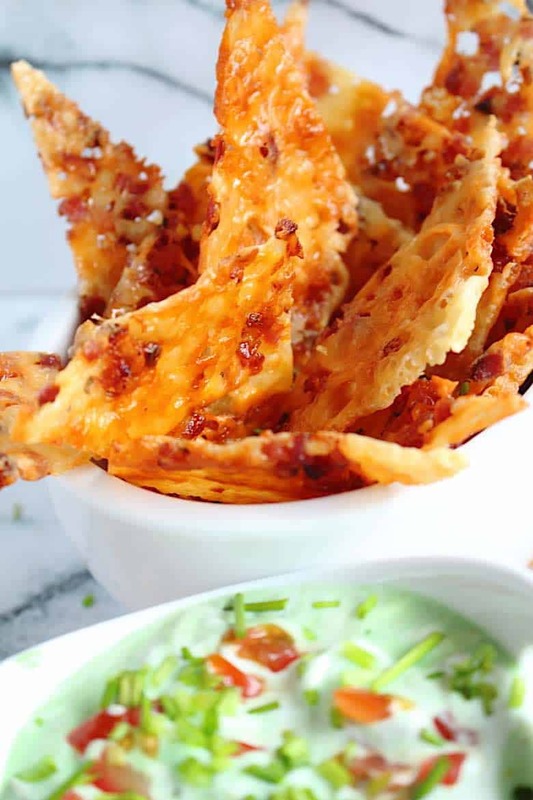 Crunchy all around, but still with a lovely bacon taste. It is like a whole meal in one. I am not kidding you. But be careful how many you eat. I have made this already a few times and once we sat for a movie to watch. But O my. The movie has not even started. In about 5 minutes all of it was gone and the whole family was asking for more. They were ready to stop a movie, so I can quickly make one more batch and then continue. And what have I done? What would I not do for my lovely family? I got up and went into baking Keto Cheese Bacon Nachos. But it was so worth it. I have made even 2x the amount, so I do not have to do it again. And if they come straight from the oven, Yum. 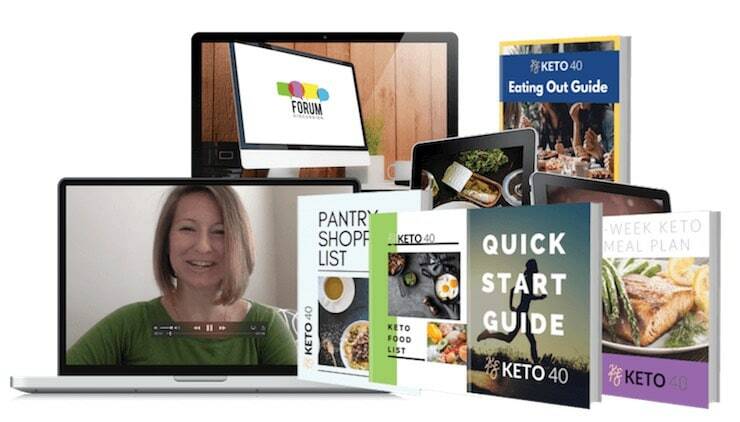 It is really surprising how so many people do not want to go through this Low Carb lifestyle path, just because they think it is boring. They somehow believe, that you have very limited choices to eat and that they will not be able to survive on it. But frankly, if you think of someone, who is fully on a high Carb diet and suddenly you start explaining what they have to get rid of, it does sounds like everything they eat. You tell them to get rid of all the bread, get rid of all the pasta, all the cakes, rice, potatoes, most of the side dishes. What would you say? They have no idea that in our lifestyle everything is replaceable. And yes, everything we make is the healthiest we can give to us and our family. When I met my husband, in the first dish I made with salad, I got an answer: I am not a rabbit to eat greenery. He loves everything we make, he adores all the veggies. He makes salads for us all the time. So. This shows you, that you can transform almost anyone into our lifestyle. For some, it takes lots of time. Some make the transformation immediately. I guess it always depends on how you serve it to them. But at the end, once they try it for a while, nobody ever wants to go back to what they were fed with before. One of the examples was when I was trying to replace Low Carb Bread for my daughter. It really took us a very long time. I even wrote about in Jogurt Buns post. I remember me trying at least 20 different recipe variations, but none worked. None of them was good enough for her. And then I have realized my mistake. More in the post above. Now we have 2 Bread variations, Low Carb Yogurt Buns, and Keto Farmers Bread which she loves and I bake them regularly, place them in the freezer and make sure, that there is plenty of it. She has it every day for Breakfast, and as a sandwich to school, so one needs to be always prepared. Especially when you are not ready to stand in front of the oven 24 hours a day. But back to those Keto Cheese Bacon Nachos. Once you make them, you can store them in an airtight container and they do last lovely crunchy for a long time. I always give a few pieces of it to my daughter inside her lunch box. And you should see that. Every time she comes from school she has to tell me how great they were and how all the kids loved them as well. One tip on how to make them nice and even looking. 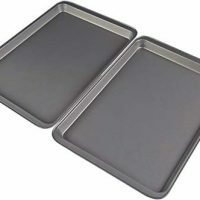 Since I am all about easy making recipes and do not want to really spend hours shaping them. What do I do to make it as easy as possible? 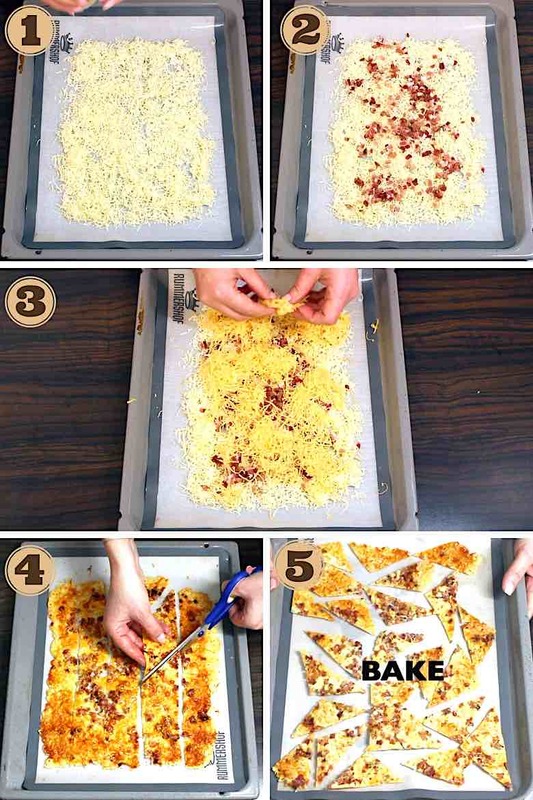 I just spread the whole mixture of those Keto Cheese Bacon Nachos on a parchment paper and let it bake. Then once it is baked, I take scissors and cut the mixture into even stripes. And then each stripe into Zick Zack shapes. Back to the oven to get more crunchiness and there it is. I guess you can not really get it easier than this. Not my idea I have to admit. I saw it ages ago somewhere on the net. 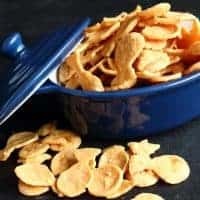 If you are still looking for some extra snacks, why don’t you have a look at our famous Keto Cheese Pops – Popcorns or Low Carb Keto Goldfish Crackers. Note: I have used Emmental cheese and Cheddar Cheese, but it is really up to you. Just make sure it is a hard cheese. 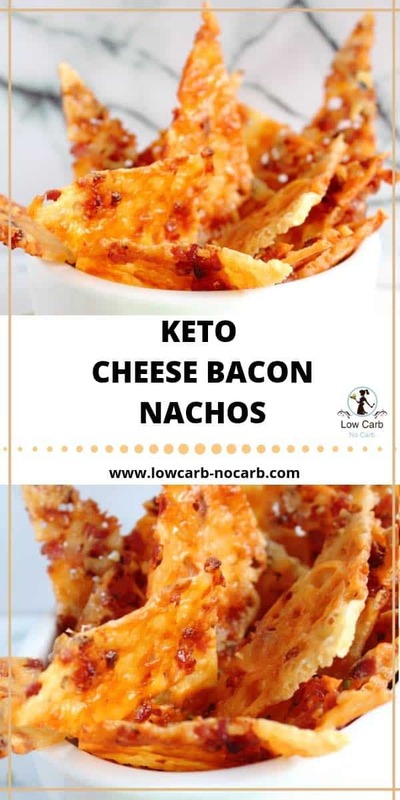 Keto Cheese Bacon Nachos are the easiest, crunchiest and the most popular snack in Low Carb or Keto Lifestyle. Try it once, you will make it always. Peel the whole sheet and cut with scissors into stripes. Do let us know what everything else you have mixed it with. I am really curious. And do not forget to subscribe to our Newsletter, so you do not miss a single recipe coming out. Here is a link to Emmental cheese how it looks like. I am sure they do have it in the shops. But in general, you can use any hard cheese for this recipe. Depending on your taste. But it needs to be hard. Not Mozareella etc. because it will not crisp. I have a question. Should we cook the bacon first or will it cook with the cheese? No need to cook it in advance. The bacon will cook or bake while all the cheese melts. These look delicious! 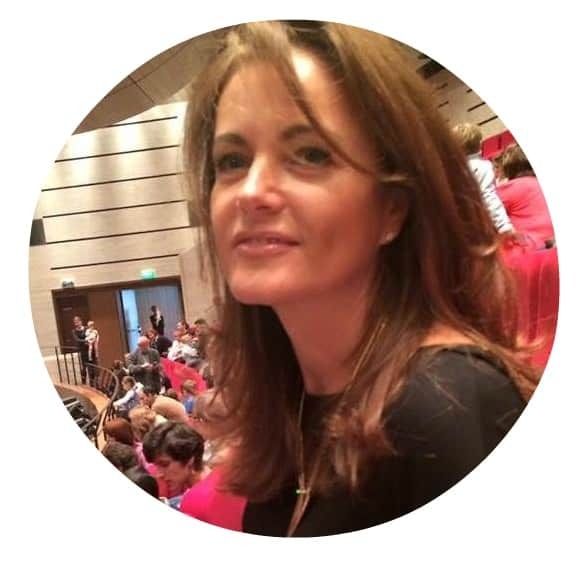 I’m so excited to have found your site, can’t wait to dive into your recipes! 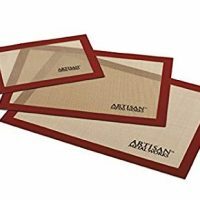 I do hope you will enjoy every single recipe in here. Sorry to write you a year later 🙂 Happy New Year by the was. No, I have not cooked the bacon beforehand. It really is enough it gets baked in the oven. So really no need at all. Have a great day and enjoy the Nachos. These were great! 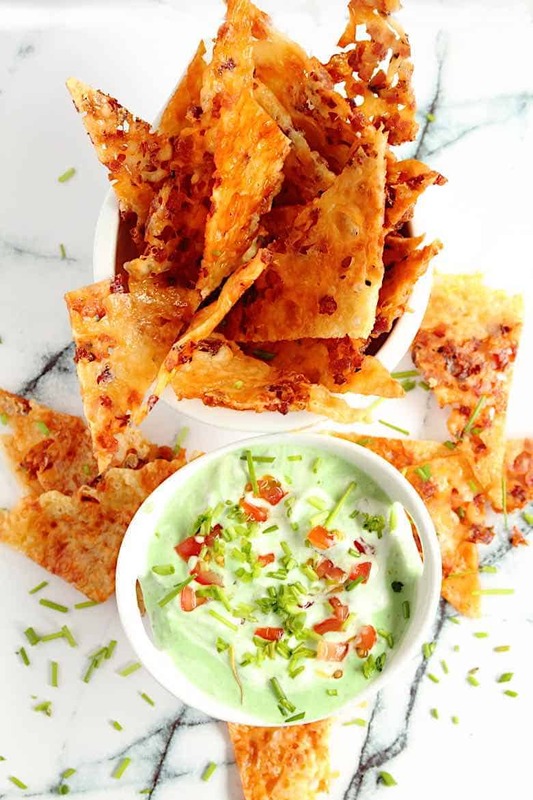 Thanks for an easy delicious recipe… although I could basically eat them all in one sitting 😉I wound up using some crumbled bacon from Costco (or maybe Sam’s Club…it’s a huge bag) and it worked great. I am so happy you have found them perfect. We are on the same boat. Once made, cannot stop eating them until they are all gone. 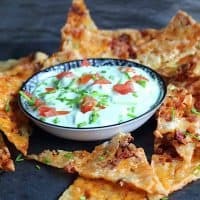 Trying this for dinner tonight😀 What did you add to your youghurt dip please? Looks so much more inviting than just plain yoghurt. I have just added a bit of avocado and mixed it together with yogurt. And yes, it is a bit tastier. Did not have parchment paper so used wax paper instead….would not peel off the cheese. A little disappointed. FYI for future. I am so sorry it got stuck with wax paper. But at least we all know for the future to never use it.